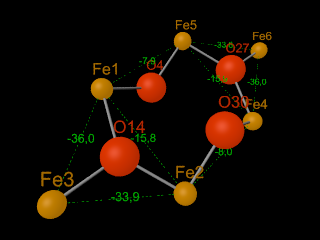 Since FeIII represent a quasi spin-only state, magnetic interactions between these cations can be described by a Heisenberg-Hamiltonian. Using the angular overlap model (AOM), Weihe and Güdel  proposed in 1997 a semi-empirical formula for singly oxo-briged FeIII dimers. In 2001 Werner et al. investigated singly and multiply oxo-briged FeIII dimers in a different span of core-ligand distances and coordination angles. wxJFinder combines the research of  and  by assuming the AOM and taking into account the experimental data presented in these works, thus providing access to many different coordination geometries in oxo-brigded FeIII systems. H. Weihe, H. U. Güdel, Journal of the American Chemical Society 1997, 119 (28), 6539 - 6543, DOI 10.1021/ja970320r. R. Werner, S. Ostrovsky, K. Griesar, W. Haase, Inorganica Chimica Acta 2001, 326 (1), 78 - 88, DOI 10.1016/S0020-1693(01)00604-1. J. 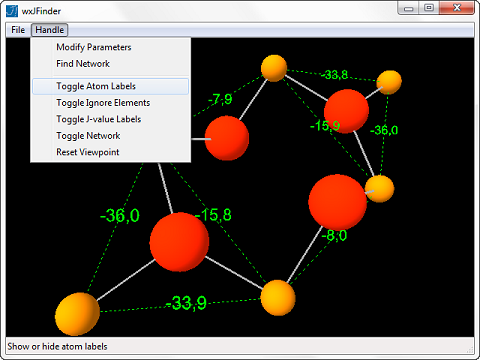 Smart, et al., wxWidgets 2.9.3, http://wxwidgets.org/, 2012. OpenGL 4.2, Khronos Group, http://www.opengl.org/, Beaverton, Oregon, USA, 2011. XMol 1.3, Minnesota Supercomputer Center, Inc., Minneapolis, USA, 1993. H. Schilder, ISODOR, RWTH Aachen, Aachen, Deutschland, 2011. Persistence Of Vision Raytracer 3.6.2, Persistence of Vision Pty. Ltd., http://www.povray.org/, Williamstown, Victoria, Australia, 2009.